Pay Yourself Instead of Uncle Sam 97% of Physicians, Professionals and Small Business Owners overpay taxes. Are you paying too much? Do you know the difference between millionaires who pay $0 taxes and you? The millionaires have a plan! They know exactly how they should handle each business expense to make sure it is tax deductible. They know how to turn personal expenses into business expenses and write them off on their taxes. This book demystifies the tax game and explains in plain English the proper way to structure your affairs to keep your tax bill as low as possible. 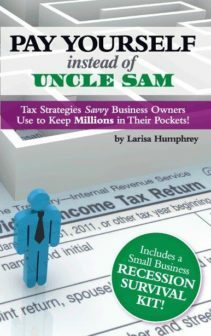 The book explains many tax strategies you can use in your business to take full advantage of the tax law and turn personal expenses into business deductions to minimizes your taxes!